The Xiaomi FIMI A3 is one of the latest quadcopters from Xiaomi, a company best known for its budget smartphones. However, the company has long expanded into other areas including aerial photography. The FIMI A3 is a budget photo quadcopter with a full HD camera onboard. How does it compare to the competition and does it offer the same value for money as the company’s smartphones? Let’s find out. There are several main features that make the FIMI A3 a popular option for beginner flyers. The Xiaomi FIMI A3 RC drone comes equipped with a 1080P camera. The cam is powered by Ambarella ISP processor and features a high quality CMOS sensor and is capable of transmitting quality imagery and footage. True, the drone does not come with a 4K camera like some of the latest quadcopters, but 1080P is a really good offer for the price and a nice spot to get started with aerial photography. The quality of the videos you will take using a drone will, to a large extent, depends on the gadget’s ability to keep the camera stable as it records the footage. Thus, camera stabilization the quadcopter comes with is just as important as the quality of the camera itself. The FIMI A3 comes with a 2-axis mechanical gimbal and a 3-axis electronic gimbal. This results in smooth noise-free footage, quite impressive for a small sized drone like the A3. The FIMI A3 is a small drone that is also quite lightweight — just about 560 grams. This, naturally, helps with battery life: the miniature drone can stay in the sky for an impressive 25 minutes with its 3-cell 2000mAh battery. This is on par with some of the best quadcopters out there like the DJI Phantom 3. While most drones of this size come with a mobile app control, the FIMI A3 is sole together with the dedicated full-sized controller. This is a better option if you are a new pilot and want to master the basics of aerial control – plus, the controller features a 4.3 inch display that will let the user see what the drone “is seeing “. To make piloting the drone even easier, the FIMI A3 comes with several smart flight modes. Namely, there is Follow Me, Orbit, Fixed-wing, Dronie, Headless and One Key Return modes. Oriented at first time pilots, the quadcopter is well prepared for force majeure thanks to several safety features: low battery protection, automatic return and automatic hover when approaching the no-fly zone. Though built for safety, the Xiaomi FIMI A3 does come with some creativity built in as well. The DIY port at the bottom of the quadcopter is all yours to experiment with: attach an LED strip, a servo, fireworks lighter, etc. The FIMI A3 is priced at $268.99 on “Gearbest”. This is quite low compared to similar quadcopters on the market – for instance, the aforementioned DJI Phantom 3 starts at $499.99. Summing things up, the FIMI A3 is marketed primarily as a great entry level camera drone for those who are just starting out in aerial photography. It does manage to pack in quite a few intelligent features into its small frame as well. Speaking of the small frame. Xiaomi is no amateur when it comes to adopting popular designs. 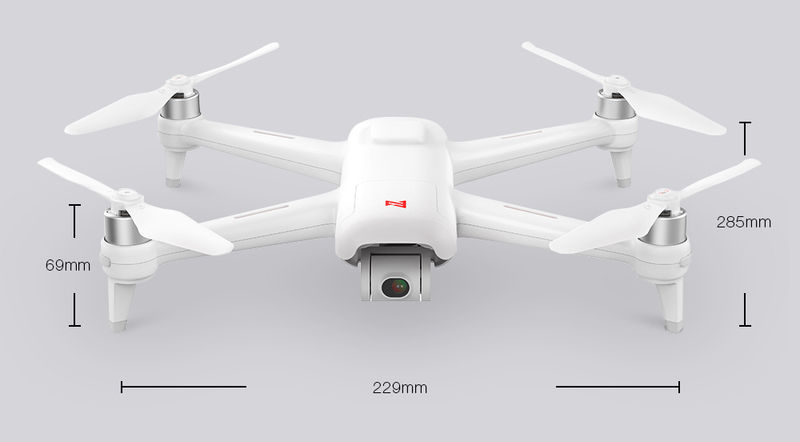 The FIMI A3, for its part, is quite similar to the DJI Spark – it is rectangular in shape, with four propellers and a cam at the front. At the bottom, there is the power on/off button, battery and the above mentioned DIY port. The quad measures xQ11.22 x 9.02 x 2.72 inches. Now, let’s review the main specs of the Xiaomi FIMI A3 RC drone. shall we?